This gross industrial lease is designed for a transaction where the landlord leases the tenant an entire industrial building. The tenant has a right of first offer to lease space in an adjacent building to be developed by the landlord. The tenant's use of the premises permitted in the lease is for general office, light manufacturing, and distribution. 1.1 Basic Lease Information. If there is a conflict between the Basic Lease Information in this Section 1.1 and the remainder of the Lease, the latter shall control. Premises: The entire building at __________ Street, ____________, ____________ ("Building"), as outlined on the site plan attached as Exhibit A, as further described in Sections 2.1 and 2.2. Commencement Date: If Landlord performs the "Tenant Improvement Work" (as defined in Section 2.4), then the Commencement Date shall be the later of (a) the date Landlord delivers the Premises to Tenant with the Tenant Improvement Work substantially completed in accordance with the Work Letter attached as Exhibit B, or (b) ____________. If Tenant elects to perform the Tenant Improvement Work pursuant to the Work Letter; the Commencement Date shall be fixed at _________ (___) days from Landlord's Delivery Date (as defined in Section 3.2(b)). 1.2 Definitions. Unless otherwise provided, definitions of capitalized words and phrases are set forth in Section 26 of this Lease. 2.1 Demise of Premises. Landlord leases to Tenant and Tenant leases from Landlord the premises described in the Basic Lease Information in Section 1.1 ("Premises"), on and subject to the terms and conditions of this Lease. Tenant acknowledges that, as of the Execution Date, the Premises consist of a building to which Landlord will add certain improvements before the Commencement Date. Before the Commencement Date, Landlord's architect shall verify the number of rentable square feet in the Premises in accordance with standards published by the Building Owners and Managers Association. Tenant's architect may consult with Landlord's architect regarding such verification. Once the rentable square footage of the Premises has been verified, the Monthly Base Rent stated in the Basic Lease Information shall be recalculated if needed to reflect the correct amount. Upon such verification, Tenant shall have no claim against Landlord or defense to enforcing this Lease based on any difference between the agreed upon rentable square footage and the actual rentable square footage in the Premises. 2.2 Landlord's Reserved Rights. Notwithstanding anything to the contrary in this Lease, the Premises shall exclude the exterior walls, the foundation, the roof and the structural components of the Building. In addition, Landlord reserves the right, from time to time, to: (a) locate, install, repair and replace any pipes, utility lines, ducts, wires, mains and structural elements through the Premises in locations that will not materially interfere with Tenant's use of or access to the Premises; (b) change the lines of the lot on which the Building stands ("Lot") and make other reasonable changes and grant others rights thereto, including without limitation grant easements, rights of way and rights of ingress and egress and similar rights to users and owners of adjacent parcels; and (c) alter or relocate any Base Building Facilities (as defined in Section 26), without material impairment (other than temporary interruptions as may be necessary in the case of emergency) to Tenant's use of or access to the Premises. 2.3 Condition of Premises. Landlord agrees to perform, at its cost, the addition of a third story to the Building, work on the Base Building Facilities and other related work, all described as "Landlord's Work" in Exhibit C attached. Landlord also agrees to perform, on Tenant's behalf, that certain tenant improvement work described as "Tenant Improvement Work" in the Work Letter attached as Exhibit B, in accordance with the terms and conditions of the Work Letter, unless Tenant elects to perform the Tenant Improvement Work pursuant to the Work Letter. Except for Landlord's Work and, if Tenant elects not to perform the Tenant Improvement Work, the Tenant Improvement Work, Landlord shall have no obligation to improve or otherwise modify the Premises for Tenant's use. 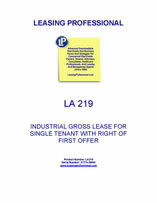 Subject to Landlord's representations and warranties in Section 2.4, Tenant shall accept the Premises in its "as is" condition as of the Execution Date, including but not limited to title, physical condition, size or dimensions of the Premises, and the zoning, building and land use restrictions applicable to the Premises.